Clear straw color. Sweet, floral aromas of wildflowers, dusty candied peach, honey, and violet with a satiny, crisp, dry-yet-fruity light body and a smooth, snappy rice paper wrapped orange blossom rice candies, dried apricot, and yellow cake finish with soft tannins and no oak flavor. A heady, floral Torrontes with earthy Argentinean flair. Bottom Line: A heady, floral Torrontes with earthy Argentinean flair. Torrontes is a white wine from Argentina; the grape is the country's most widely planted white variety. 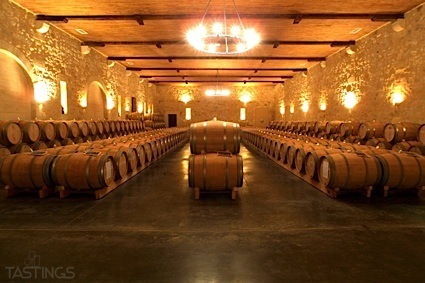 The wines are light to medium-bodied, almost always unoaked with flavors of honey, pear, orange blossoms and lychee. They do not age well, so consume them in their youth with foods such as shellfish or lighter poultry dishes. There is also a vine called Torrontes in Spain, but it has yet to be proven that this is the same as that in Argentina. 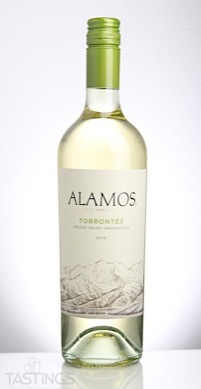 Alamos 2016 Torrontes, Salta rating was calculated by tastings.com to be 88 points out of 100 on 1/24/2018. Please note that MSRP may have changed since the date of our review.